Well, stamping friends - it's Thursday and there's a new Fusion Challenge! 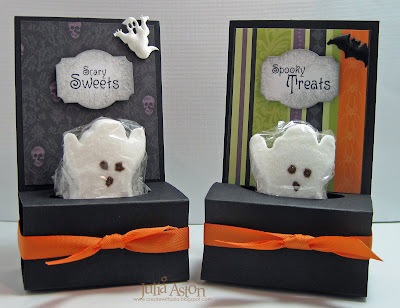 We are SO HAPPY to welcome Jeanne Jachna to the Design Team with this weeks challenge! And at the same time so sorry to be saying goodbye to Geri - we'll miss your wonderful creations and wish you the best! With spring upon us we'll be getting our gardens cleaned up and ready for planting - and today's photo inspiration puts us right in that mood! Aren't these rose backed chairs gorgeous?! Can you imagine walking into a wedding reception or shower and seeing these?! Or maybe you're not a flower person and you'll be inspired by something else in the photo - or just the sketch? I found inspiration in both for my card today. I used watercolor paper for the oval and top panels. 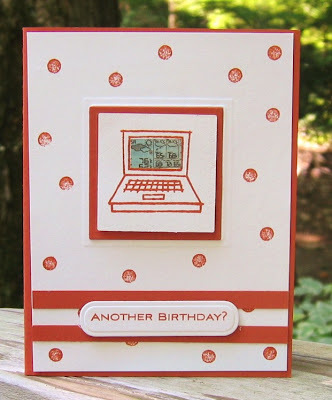 My card base is Vintage Cream card stock. 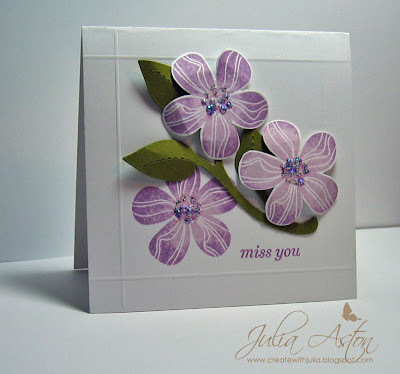 The inked flowers look softer as the watercolor paper absorbs the ink a bit more, a nice look for a sympathy card I think. The stamps are Petals and Posies from Reverse Confetti. I scored lines on the panel under the lower half of the oval to represent the lines on the base of the chair in the photo. You can see them much better IRL! What inspires you most - the photo or the sketch? Or will you do both like I did this week? 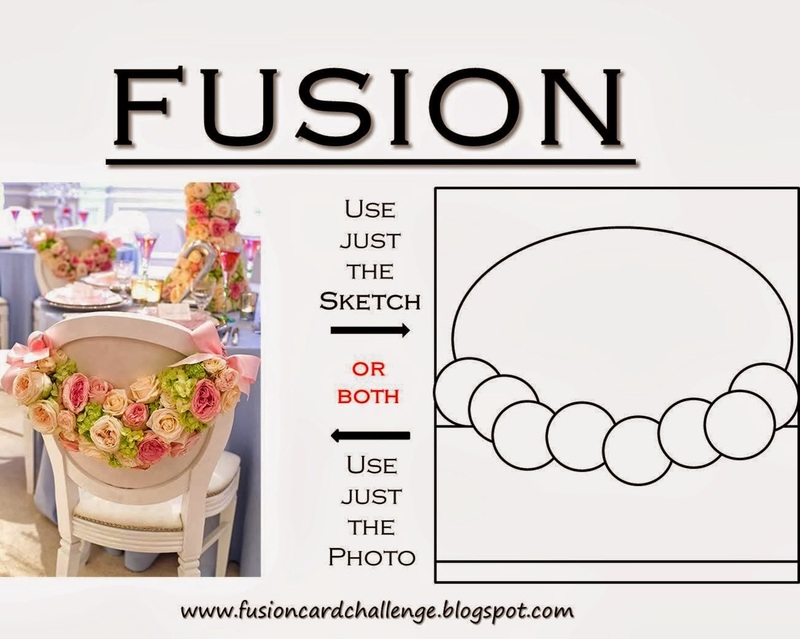 Can't wait to see what you link up over at the Fusion Challenge Blog! 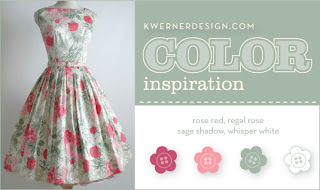 Ink: Archival Watering Can and Leaf Green, Adirondack Mountain Rose and Lemonade. Accessories: lucky blend sequins - Avery Elle, foam dots, oval die - Alterations Movers and Shapers, ScorPal. Today I have a little wintertime Snowwoman card to share. I made this for two challenges over on Split Coast - the Queen for the Day challenge and the Free For All Challenge. After looking through Queen Sue's (Mrs Noofy) gallery of lovely creations I decided to CASE her Frosty Card Things I changed: I didn't dry emboss (accept for scoring a frame) and I used a snow woman ( Miranda is her name!) and snow flake stamps from Rubbernecker instead. 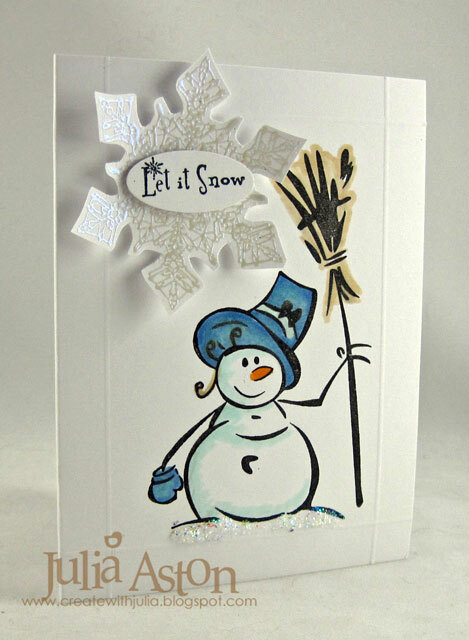 I used Stickles for the snow beneath Miranda and embossed my snowflake with a shimmery Moon Glow EP that qualified my card for the Free for All challenge to add some glitter. I popped up the snow flake and sentiment on foam tape and used a few Copics to color up Miranda a little bit. I love seeing all the sweet snowmen and women on the wintery cards people are posting - but I'm happy to keep the snow on the cards for a while! We haven't even gotten all the leaves raked up around our house yet! 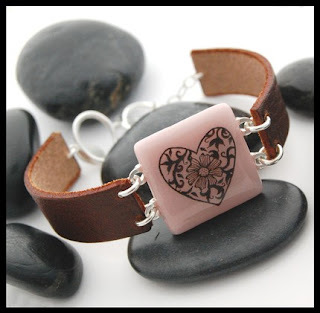 Today I was inspired by this lovely pink glass tile bracelet to create this pretty little pink Valentine. 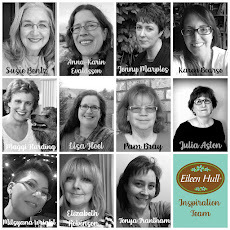 Our inspiration on Split Coast for this challenge was the Design Spirit Studio web site. 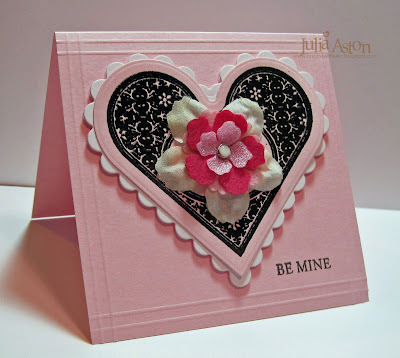 I embossed the heart with black EP and adhered it to a scalloped nestability. Then I layered some flowers and held them together with a Basic Grey glazed brad. I scored the edges to look like the beveled edges on the glass tile. My heart is from the Seasons of Love set by Waltzingmouse, the sentiment is from a new Valentine set that will be available on January 4th. I made this CAS card for the Limited Supplies Challenge on SCS - to make a quick card using a new supply and celebrating a yearly event. I bought myself this new Flourished Frame Cuttlebug folder just before Christmas and this challenge was the perfect opportunity to open it up! And the yearly event is an anniversary (my sentiment inside says Happy Anniversary) I created this card in under 15 minutes - just embossed, stamped inside the frame added a little bling and corner punched the corners! I'm also very excited to welcome Lynn Mercurio to our team as announced by our Claire over the weekend! Accessories: Flourised Frame Cuttlebug Folder, Rhinestones - PTI, Zutter corner rounder 1/2"
I am so excited to show you my project made with some of the stamps in Claire's new set being released this weekend called Little Box Labels from Waltzingmouse Stamps! 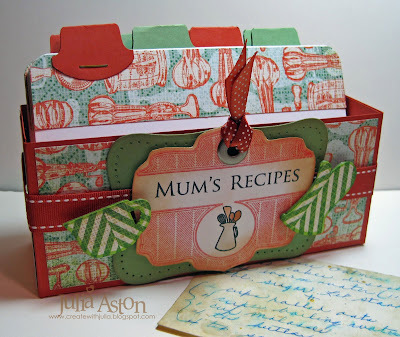 I used the label, two of the words, and the great jug of cooking utensils on this fun recipe box. 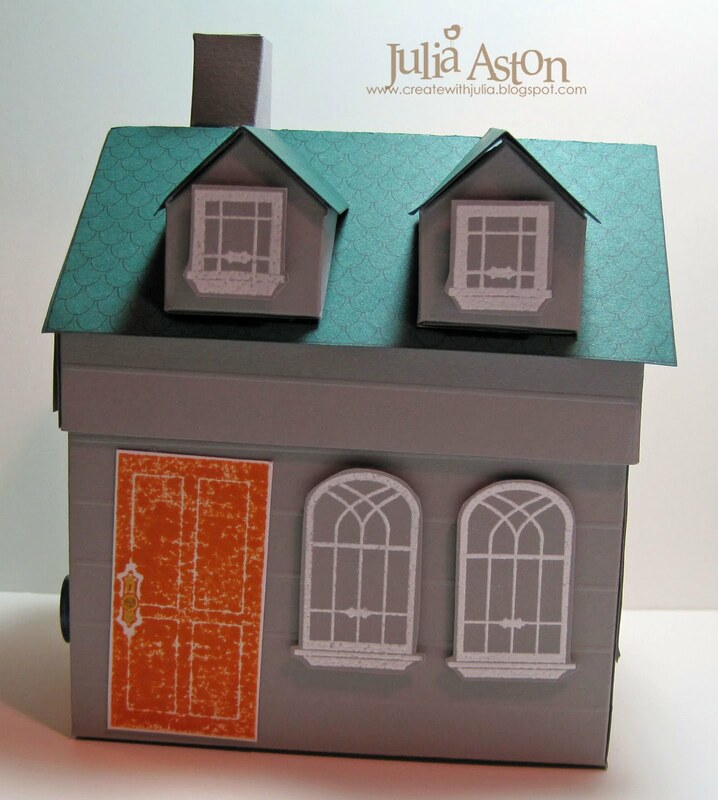 The little mit and cup are chipboard shapes from The What's Cookin set by Maya Road that I covered with designer paper (the back side of Basic Grey/Nook & Pantry/Teapots) . I inherited my mother's recipe box when she passed 7 years ago and I thought it would be nice to have a special place to put my favorite ones so I could find them easily. 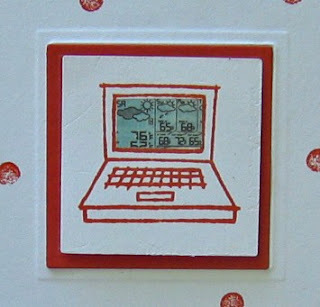 I found the instructions for this little box over on Sharon's No Time to Stamp blog over a year ago. I had printed it out then knowing that SOME DAY I'd want to make one! It's really simple to put together. You start with a 10 1/4" x 7 1/2" piece of cardstock. Holding the short edge against the top ruler on your Scor Pal, move the left edge of the cardstock over to the 1/4" mark, then score at 3" and 5". Turn the paper so the long side is against the top ruler and score at 2". Slide the cardstock to the right so the right edge is all the way over at 12 and score at 10". 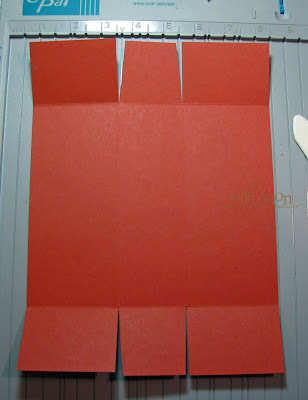 Cut on the score lines as shown below and trim a little bit off of the center pieces so it folds up easier. 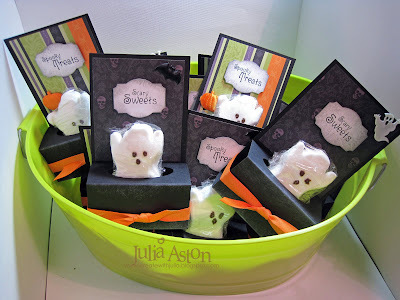 Attach Scor Tape to the edges and fold up your box! I used this wonderful Designer Paper from Basic Grey called Nook and Pantry/Beaters for the fronts and sides. 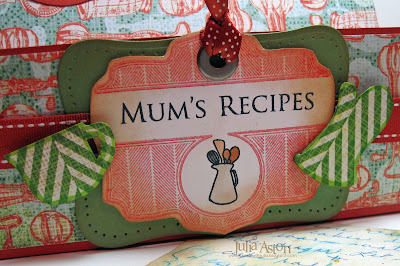 I think it gives the perfect nostalgic look for these old, well used recipes! The front & back panels are 2 1/2" x 6" and the side panels are 1 3/4" x 2 1/2". Be sure you are holding the DP the correct way when you cut if the pattern has directionality to it's design! I made my cards by cutting white card stock into 4"x6" pieces. 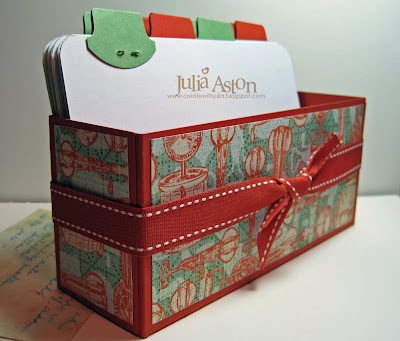 (you could also use 4x6 index cards) The DP border is 1 1/4" x 6". After I attached the DP - I cut the corners with my Zutter corner rounder. I'm not sure yet if I will use these tabbed cards as dividers for all the recipes - or if I will attach the recipe right to them and put the name of the recipe on the tag. Below you see the box from the back - I used a 24" piece of saddlestitched ribbon and knotted it in the back so even the back looks pretty! I used the Round Top Tab punch from SU for the tabs and I just stapled them onto the cards. So be sure to hop over to Waltzingmouse Stamps to check out this set as well as her new Labels set (they fit the Labels Five Nestabilities as does the label in the set I used today!) 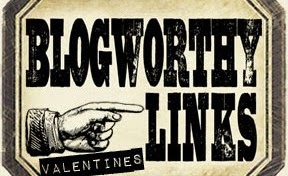 - Claire's stamps seem to sell out quickly so if you like it - be sure to put it in your cart!! She's posting the new sets either Friday or Saturday - so if they aren't there when you look - be sure to check back! 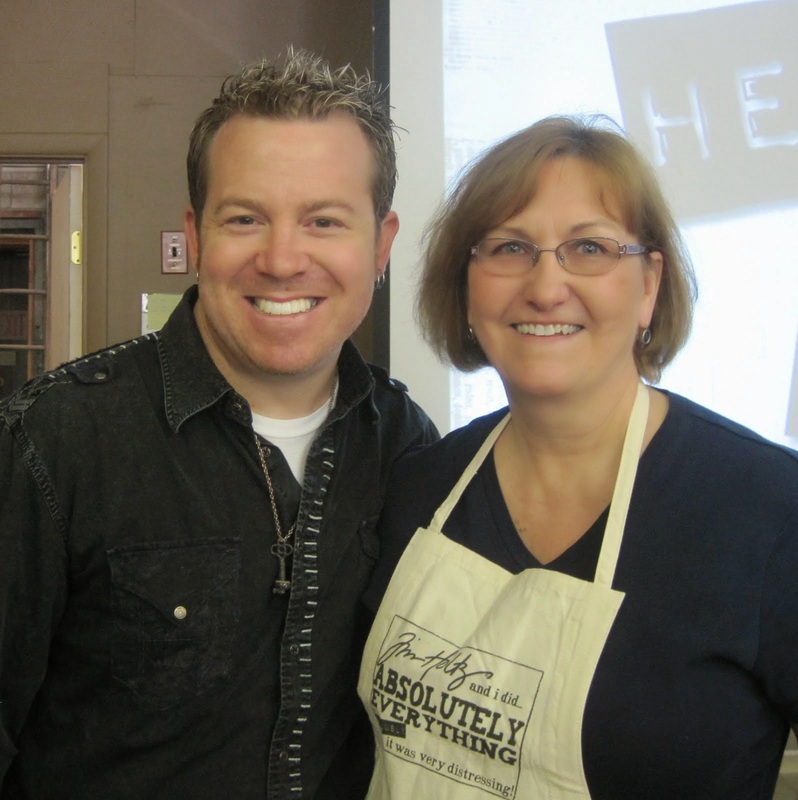 Thanks so much for coming by - I'd love to hear what you think of the recipe box as well as the stamps! ETA: please go and check out Anya's gorgeous card using this new set! Accessories: Terracotta tile ribbons - PTI, Scor Tape, Scor Pal, Cropadile, big eyelet - SU, What's Cookin Mini Chipboard Set - Maya Road, Labels Eight Nestability, paper piercer, Zutter Corner Rounder, Copics: E11, E13, E33, E40, YG03, Stapler, Round Tab punch - SU, glue dots, foam dimensionals, silver spica. 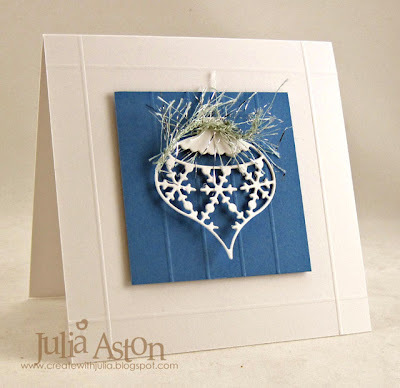 The Clean and Simple challenge on Split Coast this week was to use Bling on your card. I decided to make a new baby girl card using these wonderful Celtic Birds from the Celtic Heritage Set by Waltzingmouse Stamps . I used silver sticky rhinestones on their eyes for the bling. The ink and ribbon are Habiscus Burst from PTI. I scored some lines with my ScorPal to give the card a little depth and knoted the Satin ribbon around the top between two of the scores. Here's a close up of these wonderful Celtic Design birds. I wanted to color them in - but this IS a CAS card after all - so I left them plain this time! I just love this Hibiscus color - it's the first time I've used it. Thanks so much for coming by today!! This weeks CAS challenge on Split Coast (Clean and Simple) was to use the rock and roll technique - I inked my flowers with the lighter Lavender Moon PTI ink - then rolled the edges of the stamp over the darker Plum Pudding PTI ink. Then stamped it - this technique gives a two color image with the darker on the outside and the lighter on the inside of the image. This Eastern Bloom flower is my absolute favorite flower to stamp - I love the lines in it and how great it looks cut out and curled. 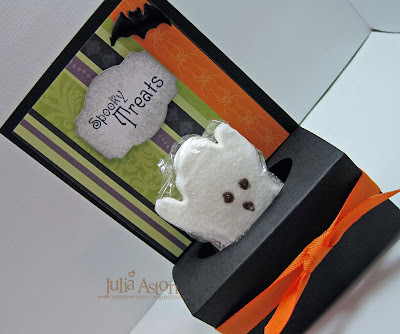 The stem is a sizzix die and I scored the edges of the card. I put some stickles in the centers of the flowers. 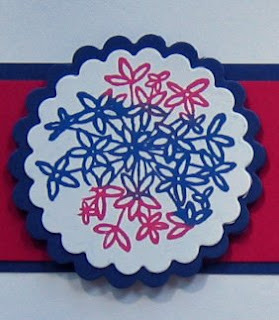 Two of the flowers are cut out and popped up on thick foam dimensionals - the third one is stamped right on the card. Thought I'd leave you with this picture from church on Mother's Day - this is Eden, my 3 year old God Child, and she gave me the pretty bouquet of flowers in front of me in the white box. They are in a round glass vase and are carnations, baby's breath and roses. She, of course, was more interested in her white grape juice and cookie! Don't you love her curls?! I used this fun new dinosaur stamp set just released by H&M Stamps for the Clean and Simple challenge on Split Coast. Today we were to follow the sketch on this card. 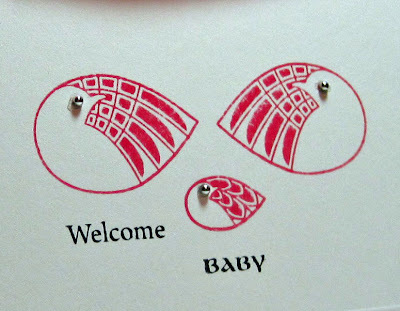 First I stamped the images and then punched out what would fit inside a 1 1/4" circle punch and layered them on 1 1/2" chocolate chip circles. I stamped the cake again on a scrap - cut out the cake part and layered it over the cake stamping. The cake and hat are popped up with foam dimensionals. I scored a few lines along the top and bottom with my Scor Pal added a knot of hemp to the gift and yellow stickles to the hat and flames for a little sparkle. Clean and Simple! Thanks for coming by today - I appreciate your comments so much! 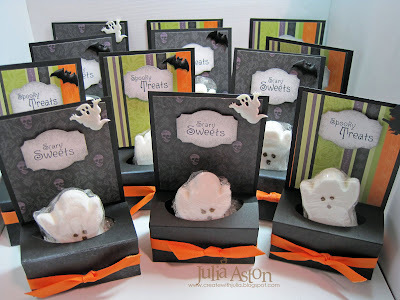 My good blogging friend, Julie (juliemlacey) was the Featured Stamper this week over on Split Coast. Her gallery is just chock full of clean crisp GIANT cards! and talk about layers!! Can you count them all on her card below??!! For my CASE (copy and share with everyone) I changed the colors and the stamps - I didn't use as many layers - but kept the wonderful layout and I used her idea of not coloring in the image - just leaving the stamped outline. Sometimes coloring just makes things look too busy - an outline can be more elegant for certain cards as was the case here (IMHO). 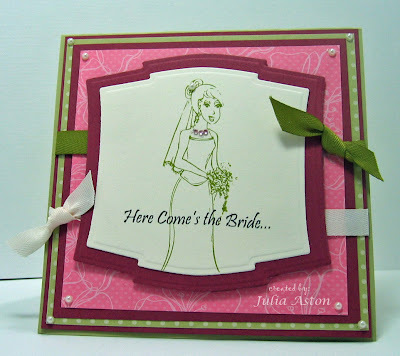 The pretty bride and sentiment are from the H&M stamp set called Just Married. I added a pearl to her hair and a tiny gem (Amuse) necklace. My card is 5x5 so Julie's must be even bigger than that to fit on all those layers! 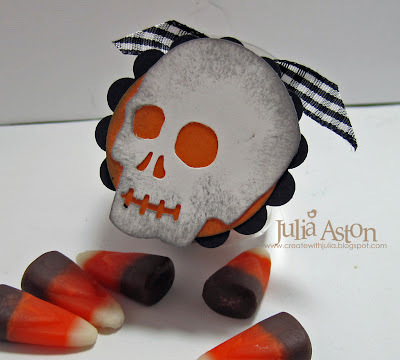 Congratulations Julie on being the featured stamper!! I made an Irish Blessing round top box for today's Try a New Technique challenge on Split Coast. 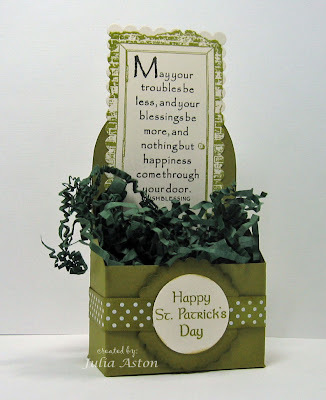 You can see the challenge and the template for the box here (adobe file at end of challenge posting) I love this door stamp from River City Rubber Works and it seems like the only time I use it is with this Irish Blessing stamp for St. Patrick's Day! 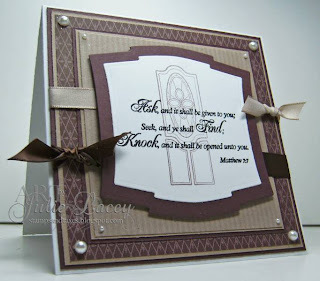 I stamped the door frame - then stamped the blessing inside (both are clear stamps). 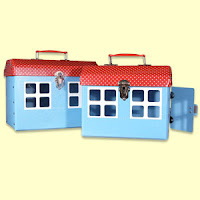 I just love this little treat box (will fill it with some St. Pat's Chocolate later!) I'll be using this for my craft sales at church - that's for sure! 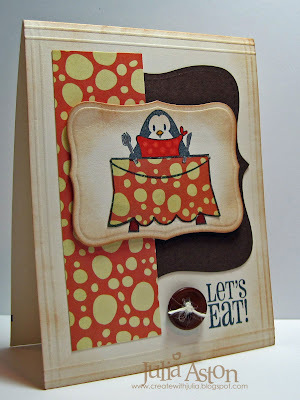 Last but not least - is this card that I made for the 2nd CAS (clean and simple) Monday challenge on Split Coast - to use One Button and to limit your layers and other supplies. There is no stamping on this card! I used white rub-ons, one button on the flower and I did 4 score lines around the border. The paper is the retired Vintage violet - which I just love! It's such a great color - I'll be sorry when my supply is gone! Here's another example of keeping my New Year's resolution - I've had these rub on's for months - and just opened them for today's card! Hope everyone had a good President's Day off - back to the grind tomorrow!! 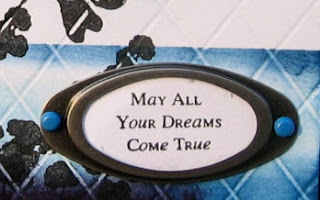 Barbara (stampedfilled dreams) was the Featured stamper over on Split Coast today. I chose this beautiful butterfly card of hers to case. We are supposed to change at least 2 things - I used a different butterfly stamp (by Artful INKables), moved the sentiment (by papertrey Ink) and omitted the ribbon but I used her colors and basic design. 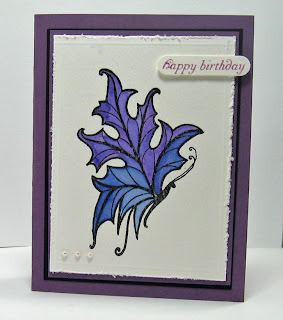 I clear embossed the butterfly and watercolored it using reinkers and my aquapainter. I scored a frame around the edge with my Scorpal and then distressed the edges. I love how this butterfly also looks like a leaf. 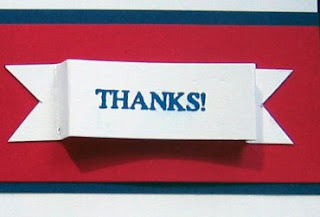 I sell some of my cards to a couple of gift shops and I try to design them flat for mailing - so I don't use a lot of ribbon unless it's just wrapped around the card with no knots or bows. I did add 3 little half pearls in the bottom left corner to balance the sentiment in the top right. 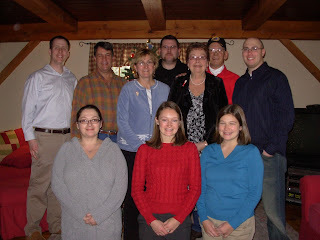 My niece, Christie, took this family picture on Christmas day at her lovely home using a tripod and timer so we could all be in the picture. From the back left to right, Nate, Kent & Julia, Josh, Marcia & Bob and Greg. Front Row left to right: April (engaged to Josh), Christie (my niece, married Nate) and Katie (my other niece, engaged to Greg). Kent is my DH, Josh is my DS, and Marcia is my sister (Bob is her DH) - got all that??!! 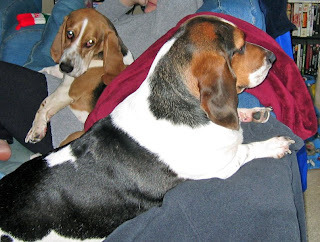 And these are my canine grandchildren - Roscoe and Daisy Mae - the basset hound children of Josh and April! Hope you all had a wonderful weekend - thanks for dropping by today! 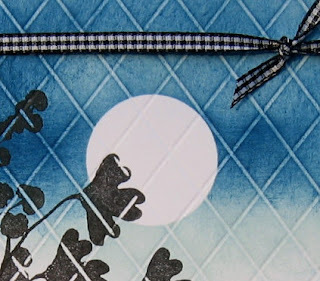 Here is my card for Sharon's DTGD challenge over on Split Coast to make a simple card. 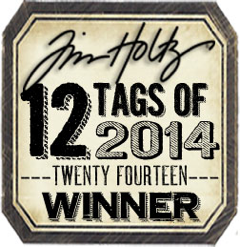 It is also for Kristina's Inspiration #17 challenge that you can see here and above. I scored a border on my white card. 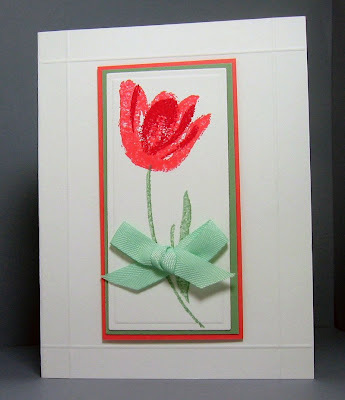 Then I stamped my tulip on a white piece that I cut with my petite rectangle nestability. I then mounted that to a sage shadow panel and a cameo coral panel (I don't have Regal Rose). That is mounted to the card with foam dimensionals. I used my horizontal punch to make two slots on either side of the stem and tied my ribbon through it. A short post tonight - I'm going to try and get some more challenges done and get to bed early! See you tomorrow! Here is my card for the Ways to Use it - Got Grid? challenge over at Split Coast. I used my Scor Pal to make the grid on my white panel scoring on the diagonal every 1/2 inch and I used Michele Zindorf's tutorial for my stamping method. Note: I sponged my ink on as I have not had much success in brayering on color smoothly the way Michele does! After scoring the panel - I masked the moon shape using a 1 3/8 inch punched circle. Then I sponged Soft Sky ink on top and bottom and then Not Quite Navy ink in certain areas as per the tutorial. I removed the mask - stamped the flowers with black Versafine ink - then sponged some Basic Black ink along the left bottom corner. I added the metal frame and stamped sentiment attaching it with 2 blue brads. I tied black gingham ribbon around the top. To finish it off I layered the panel to a black panel using foam dimensionals - then attached it all to the white card. 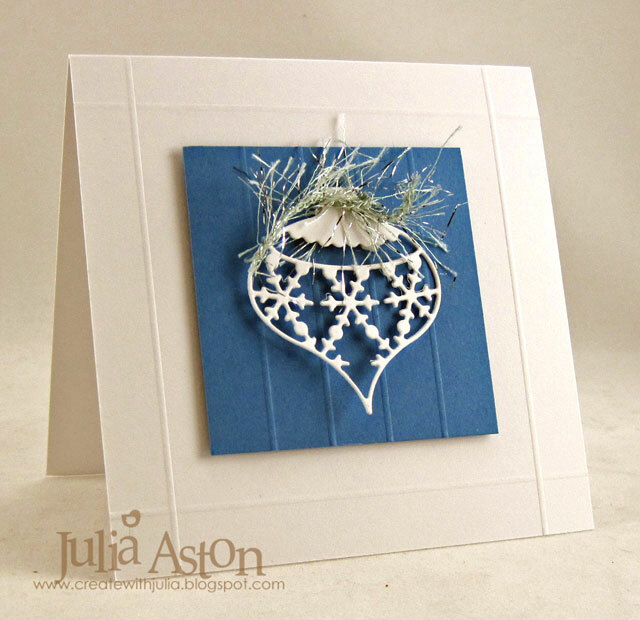 I hope you will try scoring a grid on a card - if you don't have a scor pal - some paper cutters (like Fiskars) come with a scoring blade - or you can just use a ruler and your bone folder if it has a fairly pointed end - just don't push it through the paper! I've also scored card stock with a letter opener. Try it out on a scrap first! 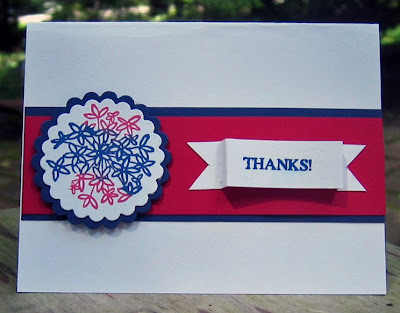 I made this card for the Limited Supplies challenge on Split Coast - the rules were: only 4 layers -only red, white & Blue colors - only 4 embellies or tools - any theme. 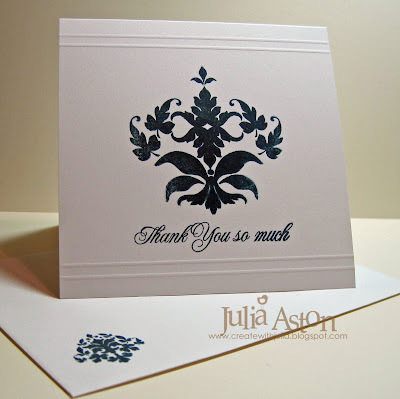 I used my new Artful INKables stamp set Sunburst Dandies - for the flower on this card. I inked it with blue and red chalk inks then layered it on scalloped nestabilities. I may have one too many layers on this card so don't count them ok???!!! By the way - Kristin is offering 10% off all her stamp sets over at Artful INKables for the month of July - so go on over and take advantage of this great sale! 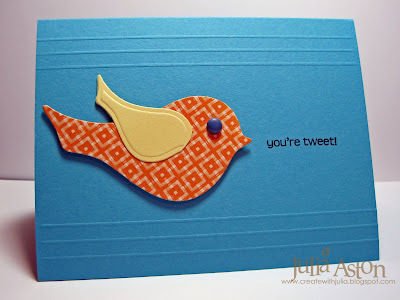 You can see all the cards I've made using Artful INKable stamps here. First I cut 2 circles with my Nestability dies- moving the top edge of the larger one above the fold in the card before I cut it so it would leave the fold intact. 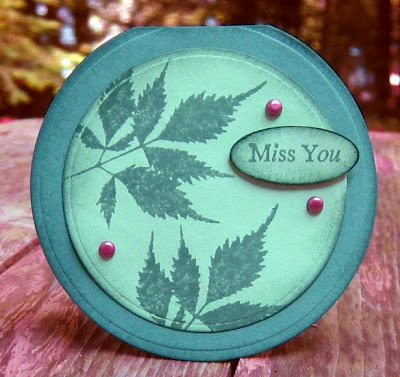 I used the fern stamp from the new Plant Prints stamp set by Artful INKables . I'm on vacation with limited supplies but just happened to have Blue Bayou and Sage Shadow card stock that worked out perfectly for this inspiration piece. I stamped the sentiment, punched it out, sponged it and popped it up with foam dimensionals. I added the brads for a little interest. I sponged all the edges with Blue Bayou ink. 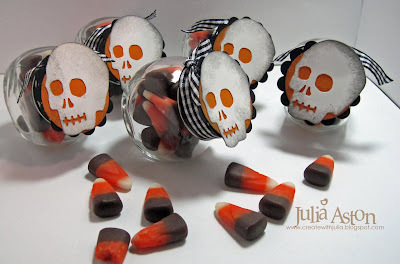 I had to put this together quickly as we are going off to a craft sale at Gunstock Mountain! Maybe I'll get some pictures and post them here tomorrow. My first card was made for the Ways to Use It Challenge on Split Coast- to score something on your card - and for the A-muse-a-palalooza challenge to use black & white and a touch of pink on your card. I made 2 score lines 1/4 inch apart on the black scalloped canopy and folded it so it stuck out over the card. I also made 2 score lines on the white panel on the canopy just to give the look of canvas. 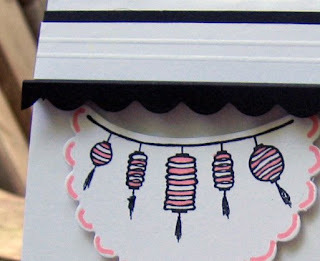 I stamped the lanterns on a white scrap and then cut it out with a scalloped circle nestability and cut off the top along the rope line. Then I attached it to the card with foam dimensionals. 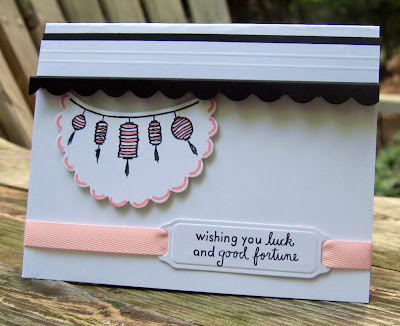 I cut the sentiment with my Spellbinder ribbon tag die and wove the pink ribbon through it attaching the ends under the tag so it looked nice on the inside of the card where it wrapped around. 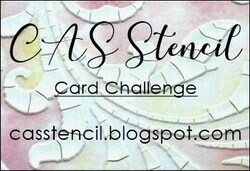 I made my second card for the Amuse Apalooza challenge to use dots on your card. 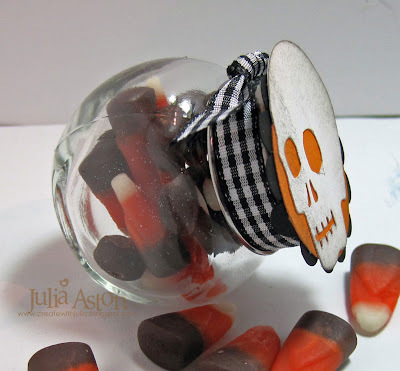 As you know if you've been looking at my blog this past week - I am on vacation and don't have a lot of supplies with me (tons but not quite enough it seems!) - so I used the eraser on the end of a pencil to make my dots! (where there's a will, there's a way!) I embossed the square on the white panel - then cut 2 more squares, one rust and one white, with my nestabilities and layered it over the embossed square. I popped up the computer panel on foam dimensionals. For a little touch of humor I cut out a weather screen from a magazine my DH brought to camp and attached it over the computer screen. I thought that it came out really cute! Guys are always checking the weather right?!?! 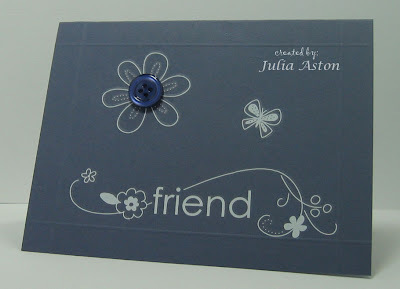 The sentiment is cut using a spell binder tag die. 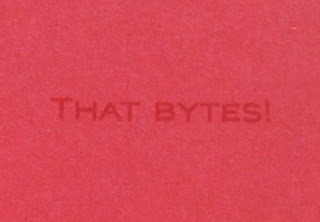 Inside I stamped the sentiment 'that bytes!'. I used these colors and no ribbon so it could be used as a masculine card. Have a safe and Happy 4th of July everyone! We'll be watching fireworks shot off over the lake tonight - can't wait!